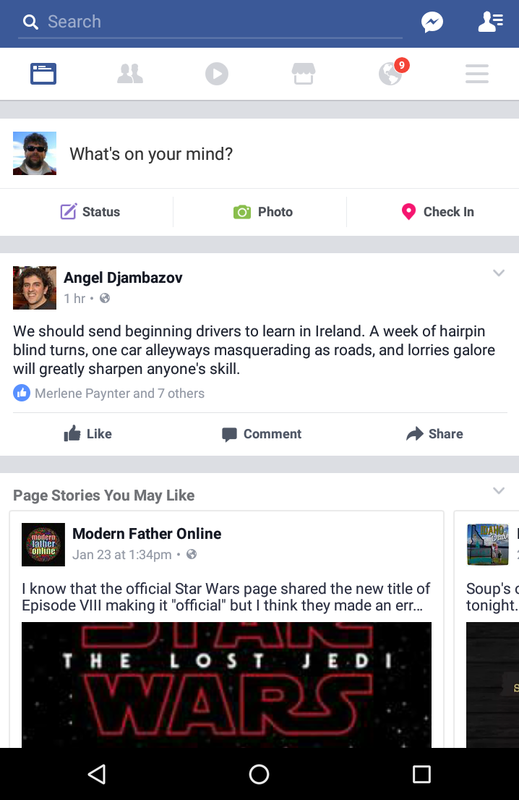 / How can my Facebook updates have a color background? How can my Facebook updates have a color background? 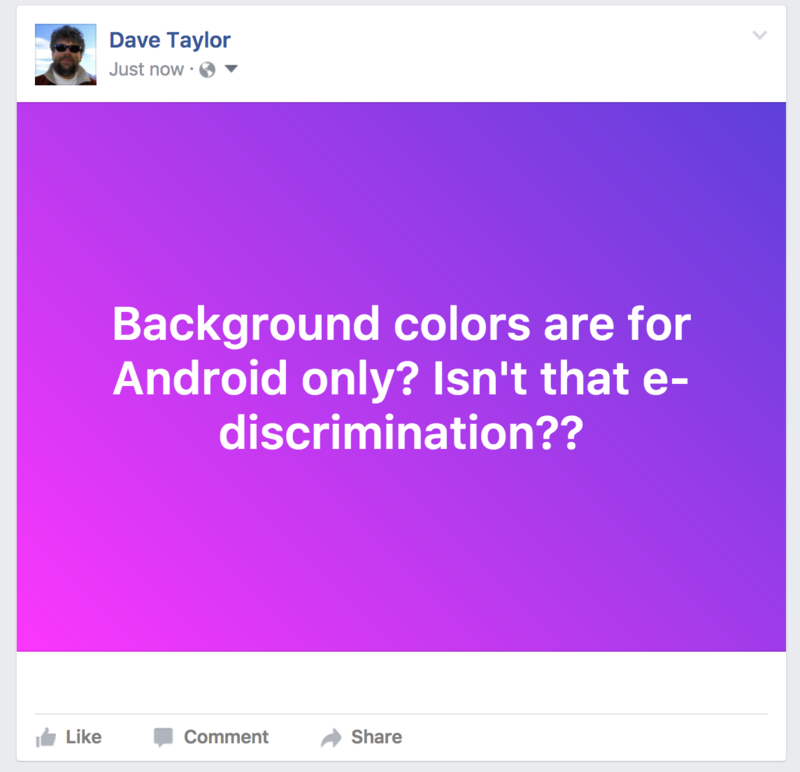 Every so often on Facebook I see someone has a cool colored background to their status update. Nice! I want. 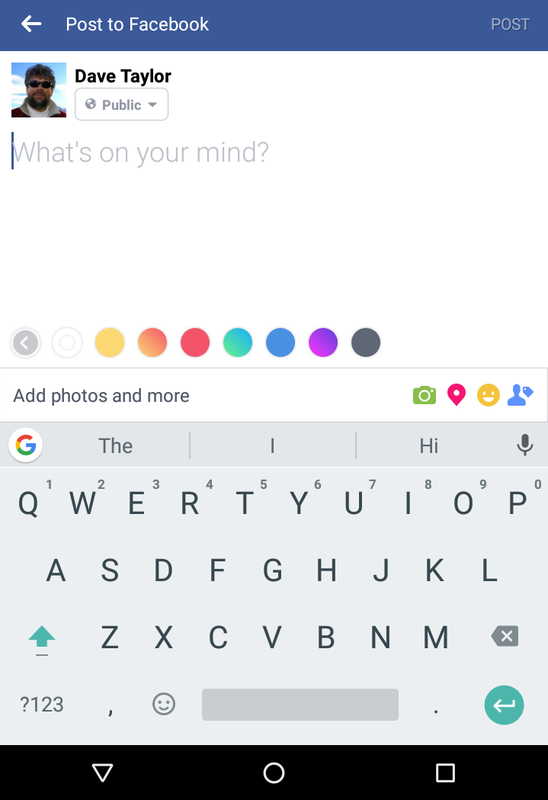 How do I add color to my status updates? While not a universally appreciated feature of Facebook, there is indeed a way you can apply one of about a dozen different colored gradient backgrounds to your status update. There’s a catch, though: It only works within the Facebook for Android app. And even then, you need to manually choose it, you can’t just have all your updates default to a pink background or similar. ‘nuf said about that. I’ll show you how to do it from your Android device, you can decide if you want to subject your friends and followers to the experience, and how often. Deal? Pretty standard looking stuff, really. Still nothing showing up, this looks pretty typical of the various Facebook apps, though having the icons + text be one per line is a bit nicer than the iOS version of Facebook. Ahhh… there they are! All the different background color options, that rainbow line of color swatches. Notice that the above is a solid color, consistent from edge to edge. Cool. Let’s pick this one and post my update! Notice also that the text automatically became centered and larger, as if Facebook knows you want to produce an instant meme or something. Handy if that is what you want to do. And while we’re talking about Facebook, please do follow Ask Dave Taylor on Facebook and don’t forget that I have a ton of Facebook help here on the site too! how can I select a background that’s different from the options available? I notice that a different times different backgrounds are offered as options, meaning something that is available one time might not be available the next time, yet it may be available at another time in the future… how can I select the background I want when it’s not available as an option at the time when I want it, but I know it’s still a valid option but not listed as one? Does this make sense or am I sounding like a mad man? You get the options you get. I think Facebook is experimenting with keeping things lively by giving different people different backgrounds, particularly the photo images. I picked a color. However, while I was typing, the color disappeared. Yes, it only works on short status updates. Once you hit a certain length, you’re back to black text on white. 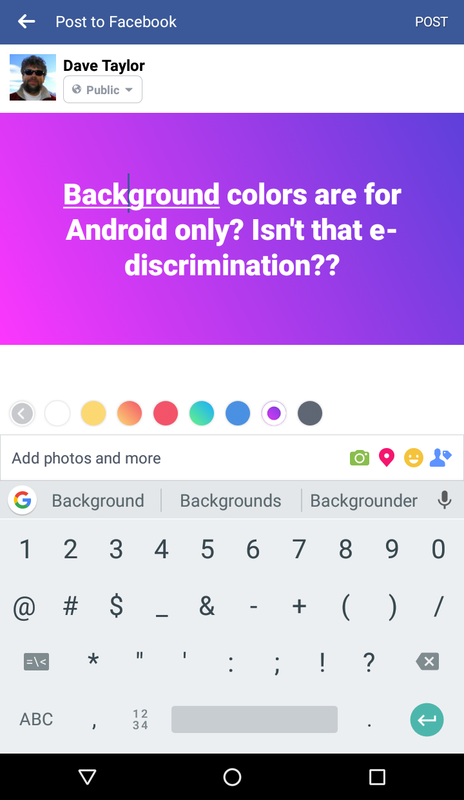 I have an android and I yet have access to coloured backgrounds. How do I get color background for Facebook on my Apple IPad? how do i get this on my PC? I don’t use cell phones. Why are some iPhones able to access this feature? I have a few friends with iPhones that can now make colored status updates, but I’m still unable to. What’s up with that? Thanks Dave, you don’t know how long I’ve been wondering about this.. Too bad it’s only for Android, but I’m guessing that us iOS folks will get this feature soon enough.